Finding the number of years, months, days, minutes, seconds, or milliseconds between two date times can be a hard task for beginners. In this post, you will learn how to calculate the difference in days between two date times and to calculate the future and past dates from the current date. These tasks can be done simply by using the Joda-Time library. It is the most useful library to work with date and times. You will need to download this library from Joda-Time website. You will get a zip file. Please extract the zip file to a folder that you can file. 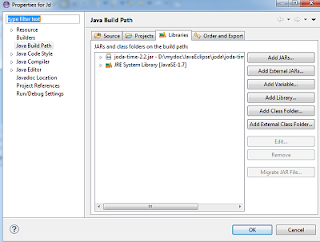 To use the Joda-Time library in your code, you need to add the jar file (joda-time-2.2.jar) to the build path of the Eclipse. You can follow the step below to add the library to the project in Eclipse. 1. From the Project menu, select Properties. 3. Browse to find the jar file that you have extracted. Then click OK. If you are using the Windows' command prompt to compile and run your java program, you will need to the add the path of the jar file to the CLASSPATH by going to the Control Panel->System->Advanced System Settings. In the System Properties dialog, select Environment Variables. In the box under User variables, double-click CLASSPATH. Then append the path of the jar file to the Variable value text box. You will use the semi-colon (;) to separate each path entry. Now you are ready to use the Jodatime library. To calculate the difference between two date times, you can use the Years.Years.yearsBetween, Months.monthsBetween, Days.daysBetween, Hours.hoursBetween, Minutes.minutesBetween, Seconds.secondsBetween methods. The example code below calculates the days and hours between the current and another future date. If you would like to calculate the future date by adding a number of years, months, days, hours, minutes, seconds, or milliseconds to the current date, you will use the plusYears, plusMonths, plusDays, plusHours, plusMinutes, plusSeconds, or plusMillis methods of the DateTime class. Similarly, to find the past date, you can use the minusYears, minusMonths, minusDays, minusHours, minusMinutes, minusSeconds, or minusMillis methods. Read the example code below. Pretty Post! Vital piece of information, I had come to know about your web- from my friend Andria, Chennai I have read nearly seven posts of yours by now, and let me tell you, your post gives the useful and the most interesting information. This is just the kind of information that I had been looking for, I’m already your RSS reader now and I feel happy about it and I love learning more about this topic. awesome post about learning center,which is useful and valuable information to share with others.it was an most helpful library to know about java programming codes. it was really good to know about these things , unique information and interesting too. Helpful post.Thanks for taking to share this.In a future everything is going to be automatic, connected and digital, embedded system engineer’s duty will be immense. An embedded system has great scope in future. Embedded Training in Chennai may get you placed in the good company. Awesome post, I would definitely say that you have explained it very well with practical scenarios. please keep sharing such articles. Thanks for your informative article on Blogger. I think of creating my new website using blogger. Thanks for your informative blog!!! Your article helped me to understand the future of. Keep on updating your with such awesome information.Thank you so much for sharing tis worth able content with us. The concept taken here will be useful for my future programs . Keep blogging article like this. I have been reading your blog posts. You blog posts are awesome. They provide good and extremely information which is more valuable. Selenium Training in Chennai is predominant famous for Selenium Automation Training and how to get the necessary knowledge about the technology and implement it in a effective way. Great blog, Thank you for giving this valuable information. Thanks for sharing this concepts admin. Really helpful.